Micronized Dolomite Powder are found in various sizes. 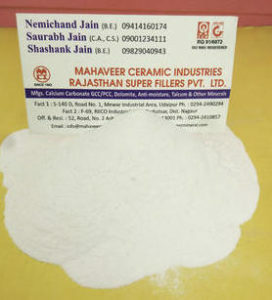 We manufactured Micronized Dolomite Powder in udaipur rajasthan india .In this post we are talking about -100 size of Micronized Dolomite Powder.-100 Micronized Dolomite Powder are manufactured in dis-integrator and then they are sorted to perfection.Then they are packed in 50 kg bags for 25 kg bags as per customers need. Generally It is white, tan, gray, or pink crystals. It is a Carbonate mineral, also known as Calcium carbonate, having an alternating structural arrangement of calcium and magnesium ions .Micronized Dolomite Powder is quality checked on numerous parameters by quality inspection . It does not rapidly dissolve or effervesce (fizz) in dilute hydrochloric acid as calcite does.